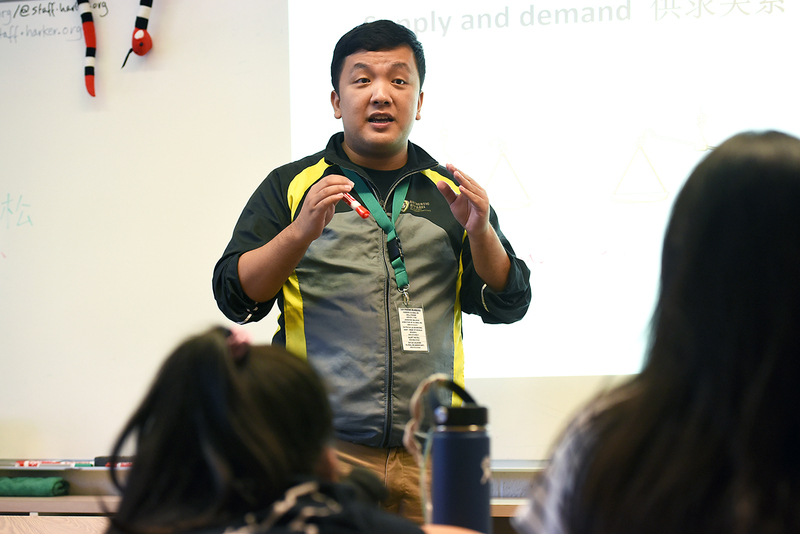 Earlier this month, Wei Chen of the Shanghai World Foreign Language Academy paid a two-week visit to Harker for this year’s teacher exchange with Harker. An English teacher at SWFLA, Chen visited the lower, middle and upper school campuses during his visit, viewing several English and Mandarin classes at each campus. Chen spent the second week of his visit at the upper school, where he taught Mandarin in Xiuyu Gao’s and Shaun Jahshan’s classes, sat in on several English classes and cheered on the girls volleyball team. Not one to squander a trip to California, Chen made time on weekends to visit places including Napa and San Francisco, where he ventured to Chinatown and Coit Tower. “It was really amazing to see get a bird’s view of the whole city of San Francisco from the top of the tower,” he said.